To all appearances, North Bank is a charming retirement town and tourist attraction - until murders reveal a darker side of crime and corruption. Margot Durand runs a French Bakery in the charming town of North Bank, Virginia. 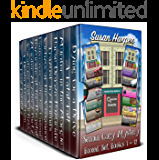 She thought it was a charming town of friendly folks, but murders soon reveal a darker side of crime and corruption. Margot must get involved to protect her friends and family, and to keep a dozen killers from getting away. 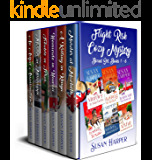 This collection of cozy mysteries includes all twelve books in the Margot Durand Cozy Mystery series. 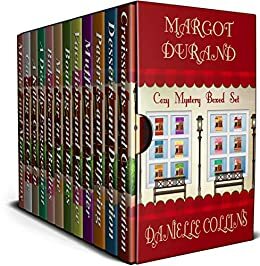 If you like cozy mysteries with interesting characters and unexpected turns, the Margot Durand Cozy Mystery series is for you. 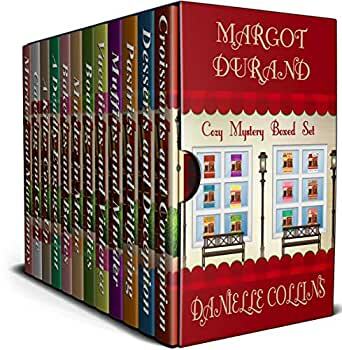 Buy the Margot Durand Cozy Mystery Boxed Set and start solving your next mystery (or 12) today! Each book in the series is a stand-alone story, but your enjoyment of each story will be increased if you read them all. Be sure to check them all out. Croissants and Corruption - When Margot's troublesome niece comes for a summer visit, she knows she is going to have her hands full. After an unexpected murder, the girl is labeled as the prime suspect and Margot is forced to fight for her niece's freedom. Desserts and Deception - When a man is murdered in the craft store run by her friend, Margot does everything she can to catch the killer and protect her friend. In the process, she uncovers a story of lies and deception. Pastries and Pilfering - When Margot attempts to take a vacation on a cruise ship, mystery follows. What starts as a small time case of robbery, quickly turns into murder. Muffins and Murder - After a conversation over breakfast muffins turns to an old treasure hunt, she gets pulled into a tale of deceptions and double-crosses. When a dead body turns up, Margot must unravel a plot that began decades ago. Vacations and Violence - Margot is excited about leaving her bakery behind for a weekend vacation at the Blue Ridge Mountain Resort. When a dead body is found on a mountain trail, it seems there will be no vacation from violence. Margot must be at her sleuthing best if she is going to bring this killer to justice and protect her friend…and herself. Boating and Bodies - Life is going well for Margot and she takes time to go on a romantic boat ride with Adam. But when the son of a wealthy mogul washes up on shore to ruin the date, Margot is forced into another murder mystery. Murder in Maine - A dangerous crime syndicate, an FBI sting, and an undercover agent with mixed loyalties. Just another case for baker-turned-detective, Margot Durand. Bakeries and Bodies – A local baking competition. One of the “friendly” competitors winds up dead. Who said Christmas in a small town was going to be relaxing? A Deadly Engagement – A long lost child, a barely-kept secret, and an unidentified body make for a deadly engagement. A Killer Cover Up – Margot is busy preparing for her new life, but she soon learns there is no escaping treachery and deception. After a body is found along her running trail, the death of an old friend gets a new focus. Catering and Crime – When a girl comes to her with a story of villainy, can Margot finds herself investigation a case with no evidence and nothing reported stolen. After a dead body is found outside a catering event, the girl’s accusations seem more solid. Murder and Matrimony – Margot and Adam are set to put mysteries behind them, at least for a while, and start a new life together. Before they can get married, Adam is named a suspect in a murder. Can Margot prove he was set up and clear his name in time for the wedding or is she destined for a life alone? Thoroughly enjoyed all of these books - getting the box-set was great going from one to the next. Bit slow in places but all very intriguing. 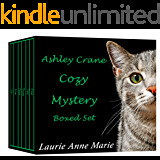 A wonderful set of cozy books. Easy read, hard to put down. Interesting story lines, without being to heavy and enjoyed the love interest, easy to feel connected to the characters. Really enjoyable read, looking forward to more.